Times they are a’changin. And nowhere is that truer than in homesteading. Before, livestock was owned for meat, milk or egg production whereas today I see more people turning to livestock for pets. Goats, chickens, even pigs are being welcomed into the family home, which I do find crazy yet hilariously fun at the same time. This post will give you my top pics of Goat Breeds for Pets so you too can add a little goat loving charm to your family. When most folks think of goats they are immediately either taken to the large goats you see climbing mountains on the Discovery channel or maybe those viral YouTube videos of little goat kids in pajamas jumping around like rabbits. The good news is, not all goats are horned mountain climbing forces that will destroy your home and yard in 5 seconds flat. The bad news is, all goats most definitely will NOT stay cute, tiny, and wear pajamas their entire life. 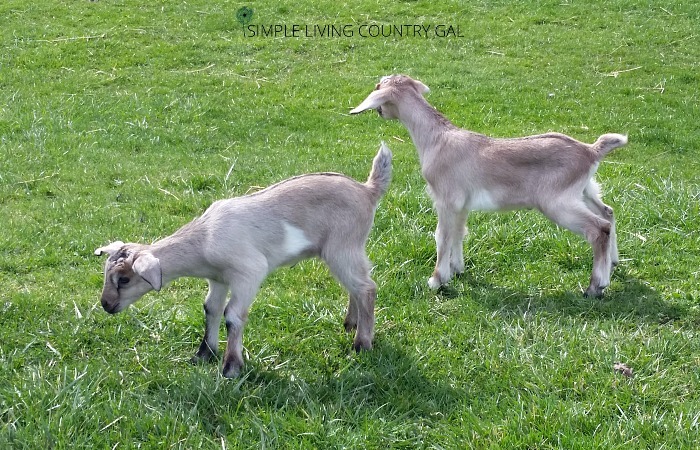 Goats do and will grow at a frighteningly fast rate, so knowing just what you are in for before you grab your little angel is key to saving your sanity and your yard. A few things before we dive into my top picks. Rule number 1. Goats are more curious than a toddler. If they hear a noise they will investigate. If they see something they will follow it. If they smell something they will taste it. This is both endearing and frustrating. Because of their inquisitive nature, you need to “child-proof” your home and your yard to ensure they are safe at all times. 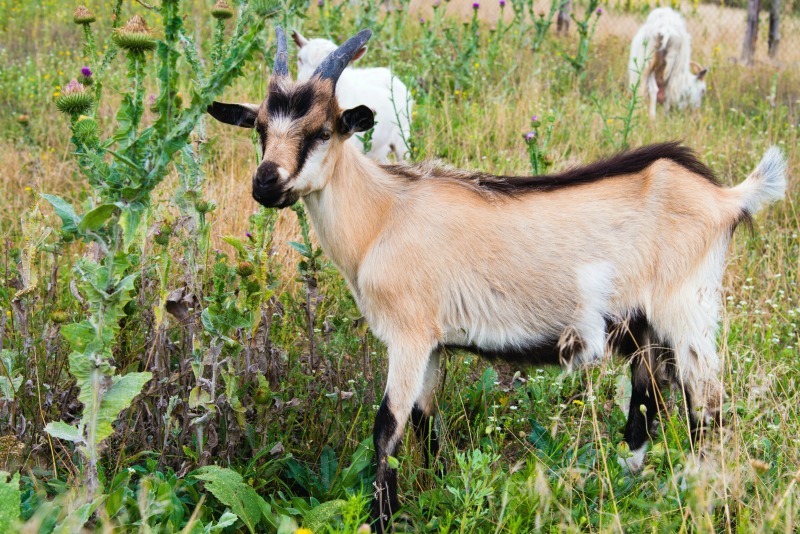 Remove any poisonous plants or bushes before you bring your first goat home. You can find a list here that will help you determine what can stay and what must go. Rule number 2. Goats LOVE to climb. And for that reason, most goat owners will provide something for them to climb on. A plastic playground bought at a yard sale, wooden spools set up with boards, a pile of rocks or tree stumps. Whatever you can find that is safe for them yet fun for them as well will work great. Rule number 3. Goats need a friend. Goats are social animals and unless you plan to keep your goat in your home all the time, you will want to get him or her a buddy. Primarily known as a herd animal, just having one more will go a long way to keeping them happy. Now, if you have your goats with another animal like a sheep, horse or a donkey you may be fine with just one. But, if your goats are with ducks or chickens or pigs a friend will go a long way to keeping them happy (quiet) and healthy. Rule number 4. Each breed has its pros and cons. Some goats are loud (Nubians) and will let you know if they are happy, unhappy, or STARVING!! Some goats are friendlier than others and some goats are better with young children. Know your breeds and do your homework before bringing a cutie home. Rule number 5. Horns hurt! No matter how sweet and gentle the goat is, horns are sharp and do hurt. Rule number 6: If you do not want any more goats, then you will need to do a snip and tuck. 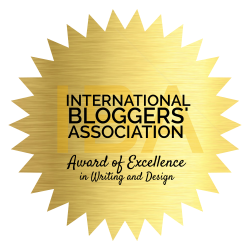 I am just going to touch on this quickly, but I do feel it’s important to mention. Does (female goats) go into heat every 21 days and Bucks (male goats) go into Rut (when they are ready to breed) for 3-6 months each year, typically in the fall. You must breed a doe in order to get milk and if you do not Wether (castrate) a buck you will have to deal with Rut, which smells. If you plant to keep your goats strictly as pets then you will need to, at the very least, wether all the males you own so they do not bother the females when they are in heat. Okay, enough of the preliminary work…let’s dive in! 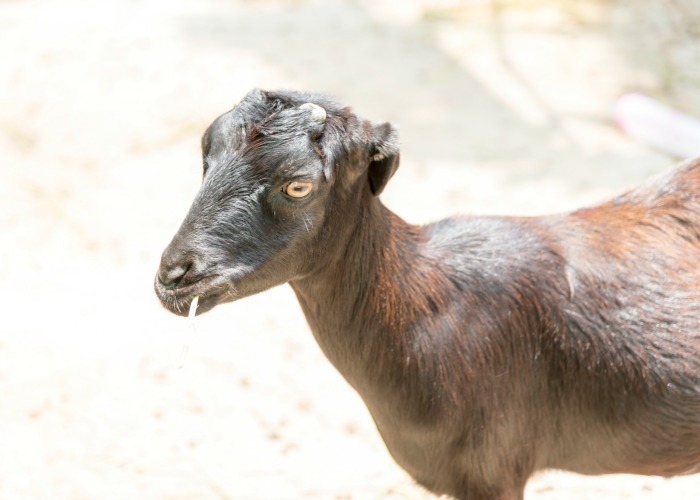 # 1 – Pygmy Goats. This is my number one pick for the best pet goat breed because of their gentle and kind demeanor. They are usually found at children petting zoos because of their smaller size and their love of hugs and human contact. If you have young children then I believe this breed of goat is a really good fit for you. Weighing in at 50-60 pounds when fully grown, they have airplane-like ears, adorable faces, and plump little bellies. A small, friendly and docile goat that loves people makes this my top pick for goat pet. 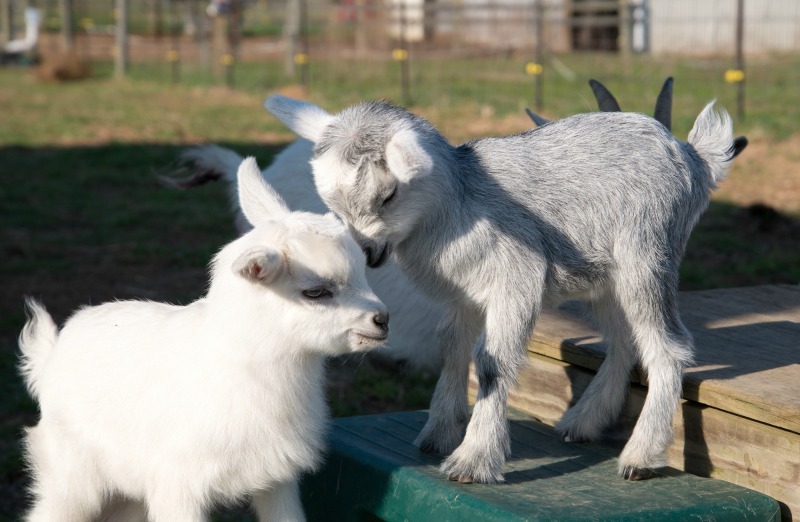 # 2 – Nigerian Dwarf Goats. This is another small breed of goat making it a top choice for a family pet. It is popular with many homesteaders because of their milk production. With similar features to the Pygmy, they have the same stature and bellies but their ears and noses are a bit shorter. They are known to be gentle goats that love to play making them a good fit for young children. # 3 – Boer goats. This breed of goat is mainly known for meat, but I have a soft spot for this breed so it is at the top of my pet list. A stocky goat that is more wide than tall, it is smaller than the taller breeds that are coming up next. They are mainly known for their wide build, long pendulous ears (which I just love! ), and short roman noses. Full grown, you can expect to see 200 or more pounds so keep this in mind. This size might be a bit much for very young children who are inexperienced with farm animals but their friendly nature still puts them on my top goat pet list. # 4 – Alpine Goats. This breed is a tall breed known mainly for milk production. So if milk is on your radar, then this might be where you want to start. A friendly and easy goat to train, they do very well on the stand and will be more patient with a new milker than some of the other dairy breeds. I love this goat and they make great companions for horses as well. Another thing I love about the Alpine is their mothering tendencies. Always loving and patient with their kids, our Alpines were great and dependable mothers with just further proves their friendly nature. Being a big breed of goat, you can expect to see sizes of 135-160 pounds at full growth. # 5 – LaMancha Goats. This is another well-known dairy breed, so again if you want a pet that also produces milk, then this is your pick. They are known for their milk production and will keep your family fridge full. A friendly and quiet goat, they do well on the stand and will be more patient than other goats as you learn the milking process. This goat is mainly known for their ears, which actually looks as if they have NO ears and their long noses. Again, they are a larger breed of goat standing tall like the Alpine but because of their gentle nature, I wanted them on my top list. If you live close to neighbors then quiet might be your top concern with goats. The LaMancha is known as a quiet breed and should do well for you. Full size, you can expect to see weights at 130-160 pounds. This gentle giant is a great fit for the new homesteader. 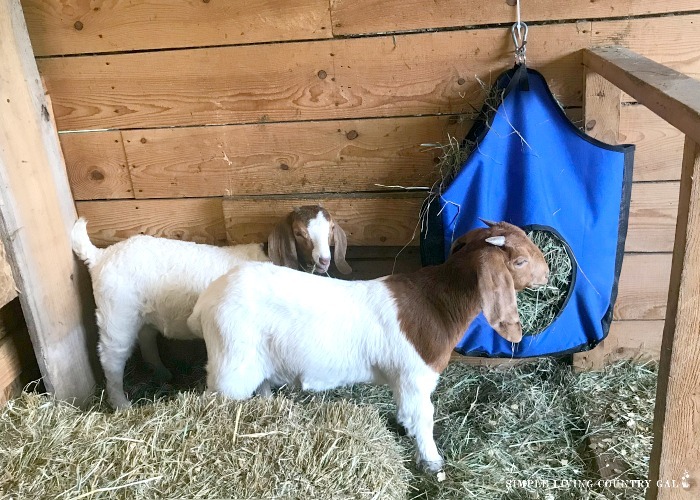 # 6 – Kinder Goats. Rounding out the list is the Kinder. A cross between a Pygmy and a Nubian this goat gives you great milk in a smaller size making it a good fit for a young family. Looking like they have a little more “meat” on them, they are considered a dual purpose breed. This simply means they are good for dairy and good for meat. One of the cons of a Nubian is their ability to be loud and crossing them with the very docile pygmy should contain some of that. Because of the cross, some Kinder goats may have airplane ears while others have the long pendulous hears like the Nubian. This all depends on the cross percentages and should have no bearing on their loudness. Full grown weight can be from 110-130 making this a nice medium sized dairy goat. When choosing a goat as a pet, you really need to take cuteness out of the picture. Know just what the end result is going to be before you head out to take a look at the cute and cuddly kids. This will save you a lot of frustration knowing just exactly what you are buying before you bring it home. Before I leave you, let’s go over quickly just what you need to house and care for your new friend. Most goats will need to be kept outside and for that reason, you will need a shelter of some kind. Depending on where you live will determine the complexity of their housing. If you live in a year-round warm climate, then a lean too that will allow them to get out of the wind and rain will do just fine. If you live in an all-season climate, then a closed shelter will be needed to keep them out of the snow and sleet. 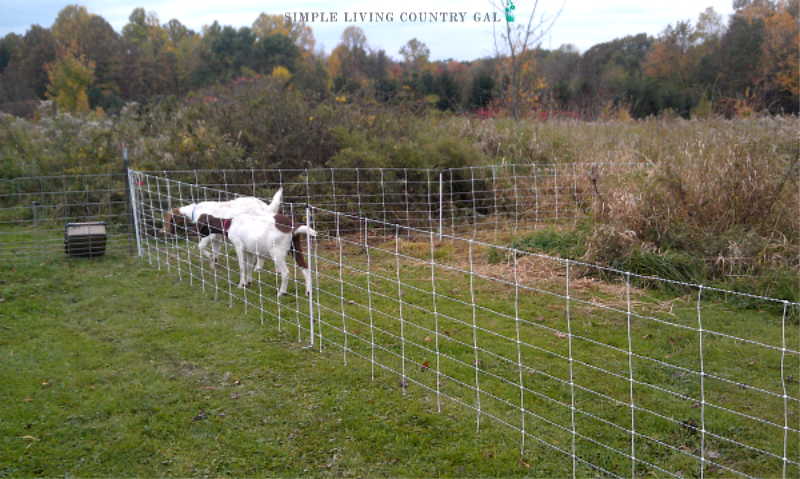 Goats LOVE to graze and having an area for them to do so safely will be good not only for them but for you as well. I mentioned above their very curious nature, so having a fenced in area that compliments in size the amount the goats that you have is key. Now, don’t let this requirement scare you off from owning goats. You do not need to spend a lot of money to fence in a grazing area. My post on fencing will walk you through the different options and the cost of each. When feeding goats you will want to take into consideration the breed that you have. This will determine the type of feed you need to give. 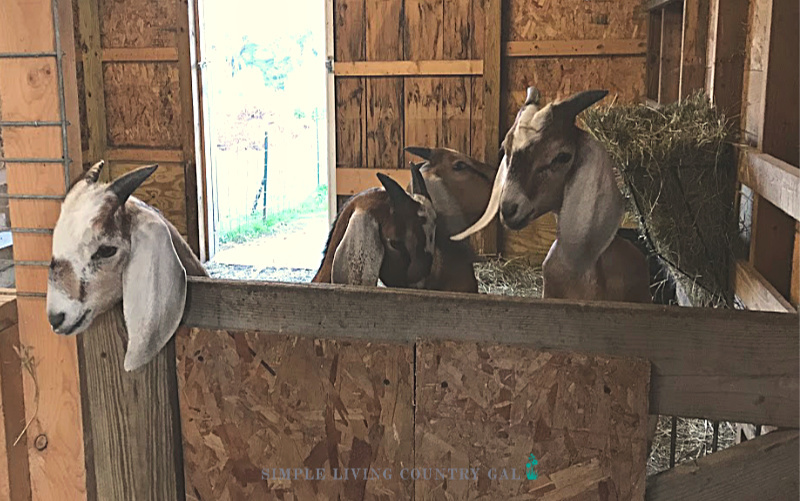 Goats do not require grain to survive and if you are feeding them adequate and good quality hay along with a healthy area to graze, your grain requirements should be used only as needed. Milking and/or kidding are two reasons when grain may need to be used. Goats need and must have fresh water at all times. As with any living things water is the key to health so change it often and make sure there is more than one resource available to them. There is nothing more rewarding than having goats on a homestead or small family farm. A friendly and comical animal they have the benefit of delicious milk, cheese, butter, and soap that really makes them a plus to any family. 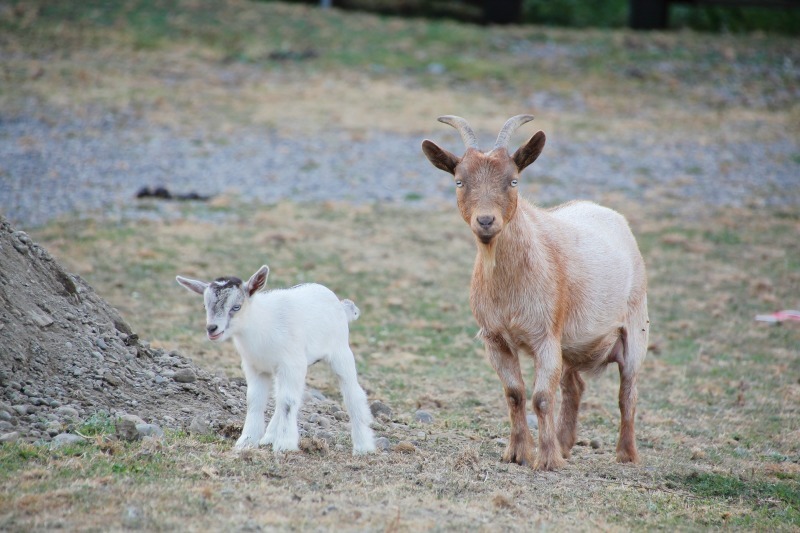 Do you have your favorite goat breeds for pets? If so, please comment below, I would love to hear from you!